Holiday Bonus is a Holiday Bonus that the whole family will love. 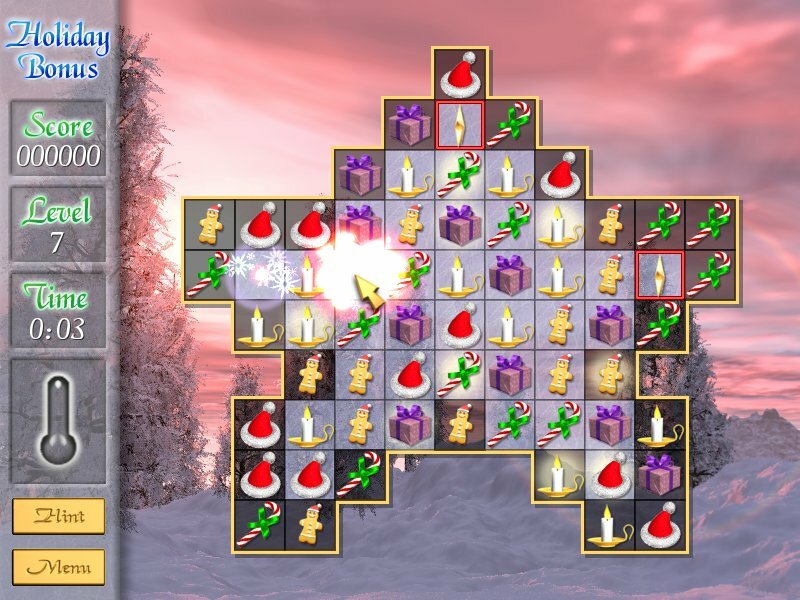 Chill out with this cool winter-themed puzzle game - it's slicker than Santa on an icy roof! Line up the dancing seasonal shapes against stunning snowscape backgrounds with an epic music score and work your way up the decorated tree. Make the right moves and your power gauge will build a bigger, brighter bonus blowout! This one's gonna snowball...so don't miss the festive fun! ...... This one's gonna snowball...so don't miss the festive fun! * Crazy bonus items including Santa's sack! Match three items in row or column to explode them, this will remove the ice panes from underneath them. Clear the level of ice panes to move on to the next level. Free items trapped in ice cubes by making matches with them. Use the many crazy bonus items to help you to clear the game grid more quickly. Release magic dust from items to fill up your Bonus Power Gauge ? this will give bonus items double the power! Unlock pictures for your gallery and set them as the desktop wallpaper. Calculates the data of the legal holidays of every year selected. Is a logic puzzle game . Qweas is providing links to Holiday Bonus 1.04 as a courtesy, and makes no representations regarding Holiday Bonus or any other applications or any information related thereto. Any questions, complaints or claims regarding this application Holiday Bonus 1.04 must be directed to the appropriate software vendor. You may click the publisher link of Holiday Bonus on the top of this page to get more details about the vendor.